“Some artists create albums for their own enjoyment. Some artists create recordings for the apparent purpose of showing off their incredible technique to impress listeners, record executives and anyone they can get to lend an ear. Ron Kaplan is different. Ron Kaplan has impeccable taste. It's quite evident that Kaplan's second self-produced recording, Lounging Around is sensitively put together for the listener's enjoyment. On "Blues in The Night" Kaplan's intimate and elegant sound is tantalizingly supported by the down-home textures of Steve Czarnecki on Hammond B-3, and Larry Scala on guitar. Some artists use diversity to anthologize themselves and prove that they can be everything to everybody. Kaplan employs diversity for the benefit of the listener, and Lounging Around is an example of the use of diversity to personalize this album to please the listener." “Aptos, California-based vocalist Ron Kaplan provides highly respectable interpretations of familiar standards in this ambitious, self-produced session, including "Blues in the Night", "Just One of Those Things", and "Caravan". Kaplan eschews vocal improvisation in favor of precision lyric delivery, with support from some of the San Francisco Bay Area's best instrumentalists, including Dmitri Matheny. Don't expect any Earth-shattering harmonic revelations here, just solid grooves on time-honored blowing vehicles." “I have always maintained that the Monterey Bay Area has been blessed with talent. I would like to add to the list Ron Kaplan, in Aptos. Everything about this release is thoroughly professional, and Kaplan's fans should be pleased with all of the selections. If I were you, I would go out of my way to hear this vocalist at a club or concert. Kaplan is one who is not afraid to tackle great standards such as Here's That Rainy Day, I Surrender Dear, Just One of Those Things, and eight others. Moreover, his accompaniment is ideal. It consists of guitar, drums, bass, tenor saxophone, flugelhorn, and the hammond organ. So it is rather obvious that Kaplan has a lot going for him in front, as they say. His range, both as a performer and in his choice of material, is given a good display in this set. Aside from the flexibility of his voice and the insight with which he uses it, Kaplan's performances are driven along by the potency of the musicians behind. This is another attempt to keep real music alive and Kaplan has done just that. The release is on Kapland Records, P.O. Box 742, Aptos, CA 95001. " “To be perfectly honest, having become familiar with Ron Kaplan's background, I was somewhat apprehensive about listening to his second album. My thinking, understandably, was that here's the owner of a successful insurance agency spending his free time indulging his vanity by recording his vocal exercises under his own label. My apprehension began to dissipate during the very first track and had completely disappeared somewhere during the third or fourth number. Kaplan's "vocal exercises" were wholly professional and quite stylish jazz singing. Although they fit entirely within the realm of traditional jazz, the album's selections are quite diverse. There are blues numbers ("Blues in the Night" and "No One Ever Tells You"), a Brazilian melody by Jobirn called "How Insensitive," several ballads, and jazz perennials such as "Caravan." Nor is Kaplan afraid to perform songs which are strongly associated with certain performers. "Papa, how is it that Armstrong is singing in a different way?" shouted my nine-year-old son from the next room during the opening strains of "What a Wonderful World." Truly, in a different way. While not having a particularly strong voice, Ron has superb command of a warm and flexible baritone that literally cocoons the listener within the cozy atmosphere of images it creates. The charts are arranged so that in almost every song his voice is backed up by a brief, yet expressive, solo, either by guitar, organ, or tenor sax. When I removed the CD from the player, I re-read the biographical notes, but this time more attentively and in a completely different frame of mind. Kaplan, who holds a Bachelor of Arts from the University of California at Santa Cruz, is a native Californian and currently resides in the city of Santa Cruz. He grew up in a family that loved and understood jazz and, from early childhood, demonstrated a pronounced affinity towards both jazz and the visual arts. Despite the heavy demands placed on his time by his business commitments during the past 15 years, he is still passionate about jazz, sings with the group "Warmth," and is a familiar performer to concert-goers in San Francisco and Monterey. His first jazz album received favorable reviews in publications such as "Jazz Times Magazine." Kaplan places "In Jazz We Trust" - a play on the motto which appears on American currency - alongside the logo of his recording company. Alright then, in his sincerity we trust. (The listener might be interested to note that Kaplan is accompanied on the sax by Donny McCaslin, who is not completely unknown to Russian audiences. - Ed.)" “This was an enjoyable batch of vocalists to review. Imagine, four sessions featuring singers, and not a dog - or wan soprano - in the batch. All four singers have robust voices, and they all know how to use them. All benefit from superior bands that complement their particular styles. Only one, Mark Murphy, can be considered a star. The other three are regional artists. To my ears the most enjoyable of the lot is Ron Kaplan, who exercises his husky baritone in and about Santa Cruz, California. Kaplan, however, almost lost me at first. He opens with "Here's that Rainy Day" pitched high in his range. He seems to strain on several notes, sounding like he hasn't fully warmed up. Now, I've heard enough mediocre vocal sessions to spot the warning signs. This was a session I'd probably be able to dismiss after a couple listenings, I thought. Then Donny McCaslin came in with a hard-driving and diverting tenor solo. Not all lost I thought. And Kaplan's out chorus, though he strayed further from the melody, didn't have the problems that plagued the first. Indeed as the session progressed, I thought "this guy's not bad." A little derivative of Sinatra, but not bad. Well, far from giving this the requisite few listens and a pan, Lounging Around became a regular on my disc player. In an attempt to address the Sinatra issue directly, I did some back to back listening to Kaplan and the master. As is the case when I do that, the connection is confirmed, but it's really the differences that are highlighted. He does favor the Sinatra repertoire, but makes it his own. Kaplan has a looser, Jazzier approach. He plays freely with the melody and is at his best when he luxuriates in his lower register, which has the richness of high quality dark chocolate. He gives free rein to it on "Blues in the Night," crooning over Steve Czarnecki's Hammond B-3. Kaplan, here and on his earlier session (3/00, p. 125), favors familiar songs. But to me one real test of a vocalist is how he or she deals with an unfamiliar number. He sings the "No One Ever Tells You," by Atwood and Coates, and drives it home so you would think you'd been hearing this song for years. If justice and taste ruled the radio waves, this would be a hit. Kaplan benefits from better than usual support. He's buoyed by a crack rhythm section, and McCaslin deserves an award for strongest tenor spots between vocal choruses. Get past those first 80 seconds and I think vocal lovers will have found a friend for life." 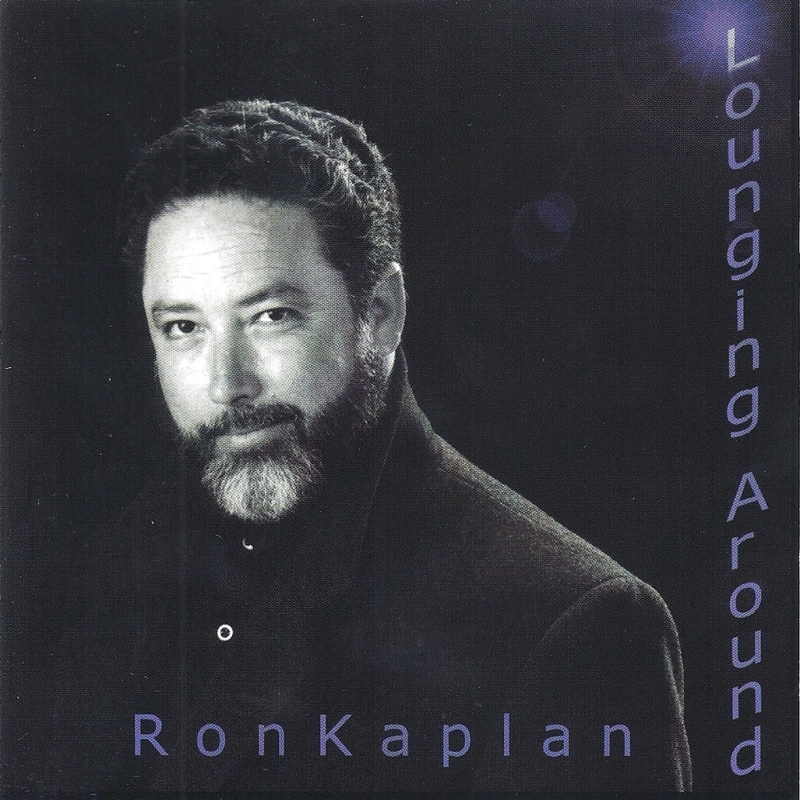 “Singer Ron Kaplan has a facile voice with a warm, breezy tone like an autumn Santa Ana blowing to sea from Southern California deserts--a sound well suited to the jazz standards ("Cry Me a River," "Just One of Those Things," "Caravan," "Moanin'," etc.) that comprise the core of his repertoire. Though he rarely improvises, Kaplan makes very tasteful interpretative choices on melodic lines, adding a note of surprise here, a subtle commentary of articulation there. Also greatly to his credit, Kaplan works with the finest players around--Hammond B-3 player Steve Czarnecki and flugelhornist Dmitri Matheny--and those not so around but who still have local ties, like Aptos High grad and now New York scene saxman Donny McCaslin. Lounging Around is all-in-all a sure-footed second step from one of the area's top jazz singers." “ Ron Kaplan is a dulcet-toned singer from Monterey, California, whose second release Lounging Around is a mellow collection of 11 standards done up in a straight-ahead jazz style with guitar, bass, drums, one or two horns (depending on the cut), and B3 organ (on three tracks). It's the kind of dreamy, soothing album that establishes the right mood for an at-home dinner date. A restrained tenor vocalist, Kaplan is more lounge crooner than jazz stylist -- the album title seems to admit as much. Still, he adopts a warm, relaxed approach somewhat similar to Kevin Mahogany's. Though he never scats on Lounging, Kaplan sings with crystal-clear enunciation and a kind of laid-back poise. He surrounds himself with capable jazz sidemen, most notably the guitarist and co-arranger Larry Scala and tenor saxist Donny McCaslin Jr. Flugelhorn player Dmitri Matheny also lends his considerable talent to two tracks. Best cuts include "Blues in the Night," which is given a lazy but pleasing B3-based treatment, and "How Insensitive," which features a breathy performance by Kaplan and a nice solo by Matheny. The swing beat on Cole Porter's "Just One of Those Things" provides a sturdy framework for Kaplan's genial vocalizing and McCaslin's cool sax. Other notable tracks include a gentle samba take on "Here's That Rainy Day," a bluesy version of "Moanin'," and a whispery interpretation of "In the Wee Small Hours." Lounging Around is not what you'd call an adventurous jazz-vocal album. Mid-way through I found myself wishing Kaplan would pick up the tempo and inject a bit of dynamism into the proceedings. He's a nice singer, but the mellow mood is somewhat unrelenting. A finger-snapping swing number or two might have livened things up. Still, this is a mellifluous collection of timeless songs from a pleasant vocalist and some competent mainstream players. Fans of Tony Bennett's mellower stuff might dig it."